What can I say? This is the only time that I have ever seen clouds at Bluff Knoll (I did see 5mins worth of cloud with Mark but it was very fleeting). It seems like ever time I head on down there they disappear for days. I think I’d almost guarantee that if went down there in the middle of winter it would be cloudless! Anyway on this particular morning I got very lucky and the sunrise was really intense and bathed the entire area in a beautiful orange glow. It was sensational. This entry was posted in australian landscape photography and tagged albany, australian landscape photography, bluff knoll, landscape photography, stirling ranges. Thats a cool image Jamie, I like it. I’m intrigued though, what does Bonanaz mean and what language does it come from. What can I say Merv? Its been a very long week. All fixed now. It was an attempt at humor Jamie ……. i understand mate. I can’t believe I misspelled it mate! I like to call this language Jamlish. A combination of Jamie and English. Normally tends to come out after a few refreshing beverages. 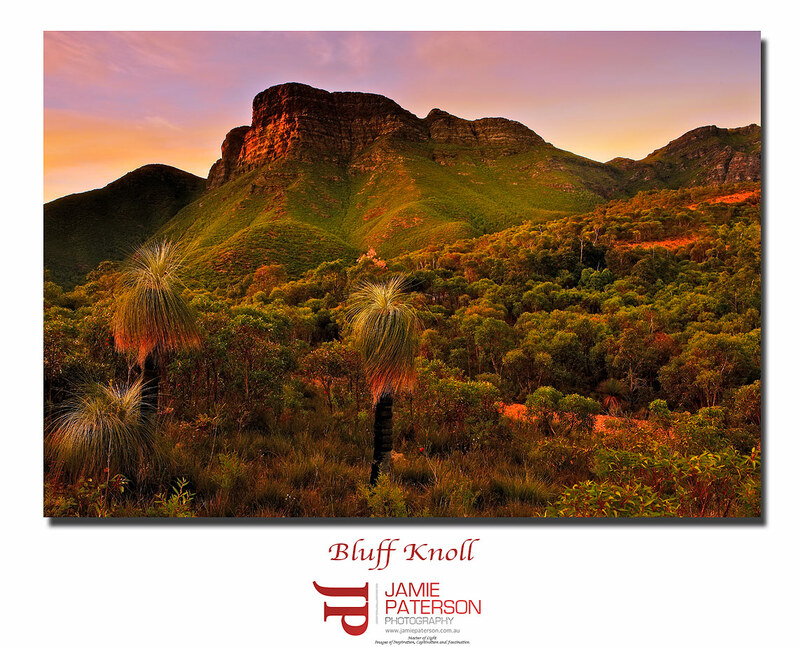 Nice image Jamie buuuut the vegetation on the slopes of Bluff Knoll looks a little strange. What do you think? Hey Tim. Thanks for the comment mate. What has caught your eye on the slopes? I’ve checked it out and I can’t see anything but you know I value the opinion of you guys. I know the vegetation is different but it does change up on the higher altitude of the slopes. That particular area looks like it needs a contrast adjustment, it doesn’t seem to fit in with the rest of the image to me. Very Nice Jamie. I know how difficult this shot can be at that time of the day. Hey Ben. Thanks very much mate, you’re not wrong its a really tricky spot to capture isn’t? Hi Jamie, nice shot looks really good. I can see where on the slope the vegetation seems to turn to an intense green colour, is that how it appears to you too? Hi Graham, it does a little but then that is because Bluff Knoll has heaps of rainfall meaning everything is quite lush and green. I’ll turn the green down a few notches though and see if that improves things. Thanks for the feedback. Thanks Chloe. It certainly wasn’t a warm morning in real life. From memory it was around 4 to 5 degrees! No problems with that. Probably won’t worry about heading down there over summer though. We could head down in Autumn. Hey Stephen. Thanks mate. I have to admit this is the comment I’ve secretly been waiting for as you are ‘Mr Stirling Ranges’. I’m really stoked that you like it. Everyone keeps telling me to not bother going up to the top as the best shots are from the carpark! If is worth the climb then I’ll do it for sure. Thanks again for the comment. Dunno what to say about that Jamie- but I think you probably already have some kind of idea haha. For starters I spose, when’s it all about a photo? I know you as an “experience” kinda guy, who lives it up for what it is at that moment, enjoying the fact you were able to be there seeing it in person. So would you prefer to have a standard experience, and end up with a beautiful image that everyone else out there has. Or would you prefer to have a freekin incredible experience, and end up with a image that may not be quite as good technically….. but combined with your experience on the day makes it an unbelievable photo for you personally? Yeah it’s hard to get good photos from up on the slopes, it’s not an easy task due to the harsh contrasts. She’s a beautiful girl, doesn’t just give it up for nothing- you have to earn it with this old girl Of all the hikes i’ve done up in these hills i’d say the camera’s only made it out of the bag on about 1/3rd of them. The funny thing I find is that my best images from the Stirlings are one’s I took way back at the start before I knew how to use a camera or anything. Fluked them in a way but I think also cos I wasn’t too concerned about getting a technically right image. I keep trying to get new images but seem to find it harder now then I did back then if that makes sense haha. Thanks Stephen. Looks like I’m off for a walk then! Yep, I have to admit mate….you wooped me with this one and you were in teh right spot when the light came on! Well done! Hi Mark. Nah you got me on our trip to the Stirling Ranges. This shot was from years previous to our trip. You still ‘Da Man’.